Anyway, with that detox in mind, I’ve also been cleansing on the outside too. 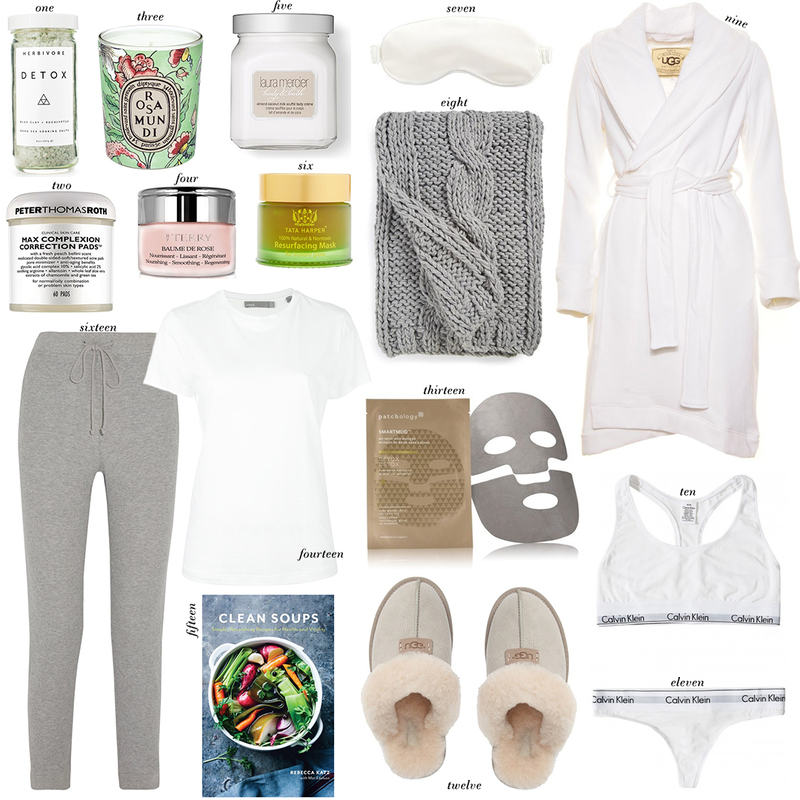 Since I’m not exactly grabbing wine with friends, meeting people for meals, or going out on the weekends with Whole30, it’s left me some time to get organized around the house and do a bit of a beauty detox! I’ve been given the gift of time, people! It’s been months since I’ve had time to relax and take a long bath (I’m normally a shower girl for speed’s sake), and this time I did it up real nice. I incorporated detoxifying bath salts and an exfoliating scrub, applied a resurfacing mask to my face while I soaked, and followed it up with a creamy body souffle to seal in the moisture. I even had a little bowl of fruit next to the tub so I could snack. It was pure heaven! You all know my love of Eberjey pajamas, right? I have quite a few pairs now, and for good reason. They are SO soft! They come in a bunch of different colors and prints, so you’re bound to find a style you like. My sister and mom think I’m nuts, but I don’t like sleeping braless. There’s something about the lack of support and sensitivity that bothers me – probably TMI, but whatever. I obviously don’t like to wear a cupped bra while I’m sleeping, but I do like some sort of support/coverage. I usually opt for a stretchy one like this scoop neck wireless style. It’s not restrictive at all and so comfortable! It’s a great bra to throw on when you’re just lounging around too. Do y’all do towel time before fully getting ready like I do? I usually like to let my hair towel dry for 10-20 minutes before blow-drying, so I lounge around and watch some TV in a soft robe while I wait. It’s just a few minutes of bliss before I have to get going! Doesn’t this robe look fabulous? I wouldn’t mind snuggling up in it right now. My favorite mask to use when I’m in need of a good exfoliation is Tata Harper’s Resurfacing Mask. They say it’s not recommended for sensitive skin types (which I am), but I’ve never had an issue with it. I only use it a couple times a month though. This mask acts like a peel to slough off dead skin cells and reveal bright, fresh skin! It’s very effective and smells like it belongs in a 5-star spa. I use the patchology mask and it is amazing!! Love these picks! How are you drinking your coffee if you are not adding sugar? I want to do the same to stop sugar but it seems like all I eat has sugar. I do a smoothy in the mornings with fruits, but is’t that sugar? I use unsweetened coconut milk, a splash of coconut oil and cinnamon to add some flavor. It’s certainly not sweet, but it makes coffee a lot less bitter! On Whole30 you’re allowed to eat all fresh fruit, but no sugar, fake sweeteners or sugar supplements like honey, agave, etc. Hope this helps!